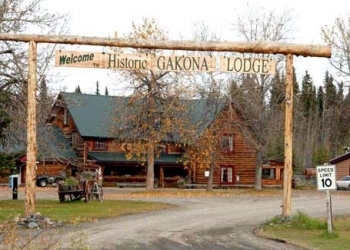 Gakona Lodge is one of the oldest lodges in Alaska! The cabins are also historic and have been recently remodeled . If you want to truly experience Alaska, this would be a great place for you to stay. If you are expecting a fancy hotel then you should probably consider other accommodations. The cabins all have private bathrooms, and most of the rooms in the lodge have shared bathrooms as in the days of old. The lodge has wireless internet and public access to internet. You'll find the lodge cozy and refreshing. In the winter, the Carriage House Restaurant is closed but the lodge offer a continental breakfast for nightly customers and home-style meals for those on extended stays. The cabins are available in the winter for extended stays. Gakona Lodge is adjacent world class salmon and trout fishing on the Gulkana, Delta and Klutina Rivers and 2 hours away from awesome halibut fishing. 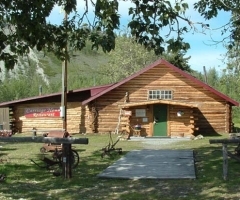 The Historic Gakona Lodge is located at the confluence of the Copper and Gakona rivers, at Mile 2 on the Tok Cutoff to the Glenn Highway, 15 miles northeast of Glennallen and 200 miles north of Anchorage. Gakona Lodge is one of the only original remaining roadhouses. The Ahtna Indians have lived in the Copper River basin for 5,000 to 7,000 years. Gakona served as a wood and fish camp and later became a permanent village. In 1904, Doyle's Roadhouse was constructed at the lodge's present location. The original lodge is no longer in use but is still standing. In 1910, the roadhouse became the main stop for the Orr Stage Company. The location was chosen because it is the junction of the Valdez-Eagle and Valdez-Fairbanks trails and became an essential stopping point for travelers. Gakona Lodge, which is still in use, was completed in 1929 and is listed on the National Register of Historic Places. Gakona Lodge and Trading Post contains original buildings and old relics that were found in the area or donated by various people. Today, travelers on the Tok Cutoff can stay at the Lodge (Mile 2) and see relics and equipment from the era. You can no longer get your horse re-shod but can load up on supplies much the same way that pioneers did it one hundred years ago. 11 buildings on the site are listed on the National Register of Historic Places. The buildings - all but two of them made of logs - went up in spurts, timed to improvements in the roads. 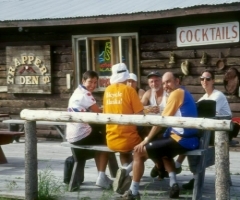 The original roadhouse (located in the back corner) was known as Doyle Ranch, after Jim Doyle, who homesteaded in 1902 at Mile 132 of the Trans-Alaska Military Road (now Mile 2 of the Tok Cutoff), the name of the new Valdez-to-Eagle Trail. Doyle grew spuds, vegetables and feed for the horses. In 1904, he built the lodge, ice house and storage shed - all added to the national register 30 years ago. The original 1904 roadhouse held living quarters, a kitchen/dining room, a few private rooms, an upstairs dormitory and a store. A telegraph station stood nearby. With no bridge to Gakona, summer travelers crossed by boat. Traditionally, there were road houses located approximately every 20 miles. 20 miles was the distance that an individual could reasonably travel in a day. Sadly, only a couple of the original roadhouses exist (Gakona Lodge being one of them.) The remaining have most commonly been destroyed by fire. By 1905, gold fever had spread to the Tanan River Valley, and a new trail was blazed from Gakona north to Fairbanks. A stage company made the roadhouse a stop in 1910, and Doyle added a barn that could hold up to a dozen horses. Between 1912, when Doyle sold out, and the late 1920's, the property had several owners, including a mining company. The last of them was Arne Sundt. His granddaughter resides in the red cabin on the corner of the property. 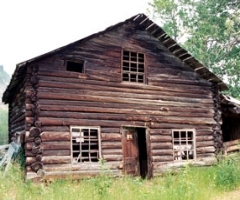 In 1929, when the Alaska Road Commission widened the Eagle Trail for easier access to gold mines in Chistochina and Nabesna to the east, Sundt built the larger Gakona Lodge - the present roadhouse - with 9 private rooms, a bunkhouse (attic), two bathrooms, a general store and a post office. A wagon repair shop, two cabins and other buildings were also added. World War II road building fed the last growth. In 1942, the Army Corps of Engineers put a garage at Gakona, adjacent the present lodge, to house gear used to build the Glenn Highway. After the war, the garage became a store. A shower house was constructed by the Army Corp adjacent the present lodge in 1942 and in 1962 it was converted to the "Trappers Den Bar" and later the "Trapper's Den Tavern." In 1976, Jerry and Barbara Strang purchased the Lodge from Henra Sundt. In 2004, the Lodge was purchased from the Strang's by Valori and Greg Marshall. All structures on the premises have been subsequently added to the National Register of Historic Places. The lodge and cabins have known famous guests. Judge James Wickersham, the first federal judge for Interior Alaska, waded through overflow water to reach the roadhouse in 1905. Artists Ted Lambert, Eustace Ziegler and Josephine Crumrine spent time here. Bill Egan, the first governor, stayed often during his years in office. Arctic Explorer Hubert Wilkins was a guest. Gakona Lodge has an "infamous" ghost that favors room 5 of the lodge. He smokes a pipe and seems to enjoy playing tricks. There hasn't been the pipe smoke since a non-smoking policy was instituted in the lodge. Many people speculate that the ghost's name is John Paulsen, a customer and business partner many years ago. He has been a pleasant guardian of this lodge for many years and we continue to enjoy his company. Mile 2 - Tok Cutoff Rd.